The HI-100® Control Valve is well-suited to meet the most demanding application needs. This severe service valve delivers high performance in harsh applications, including those found in the chemical, petrochemical, refinery, and power generation industries. The HI-100® valve has several distinctive features. The valve has an in-line straight-thru venturi flow design, replete with a spherical ball control element. The ball is enclosed within a specialized cage, which positions the ball relative to the downstream seat via linear stem travel. This unique design has no close clearance between its components; this facilitating smoother, more efficient operation at low-to-high temperatures (from -425°F to 1900°F) and in slurries and other harsh fluids. Additionally, the HI-100® Control Valve is fitted with a Quick Change Trim feature that allows in-line replacement of internal trim; this includes the ball, stem, cage, seats and seat retainer cartridge, as well as the wear bushings. The upstream/downstream seats and wear bushings are fully interchangeable, which helps extend the service life of the valve and reduce maintenance costs. The linear flow characteristic of the valve provides exceptional flow control over the widest possible range. The DFT venturi-ball design works with the physics of fluid flow. As the flow exits the valve, a diverging nozzle controls both expansion and recovery, ensuring no turbulence is added to the flow stream. 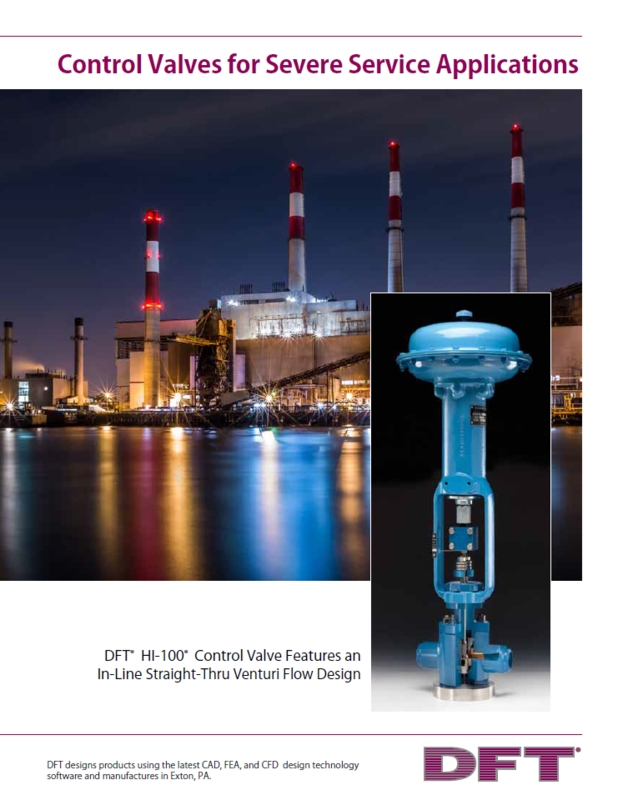 Learn more about this heavy-duty control valve by contacting DFT today.